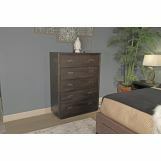 This Hyndell Collection is made with solid wood and rich looking Mango veneers finished in a dark espresso brown color. 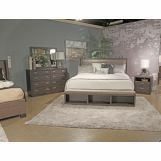 The upholstered headboard is designed to work with a low profile storage footboard. 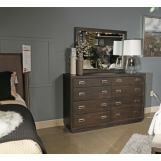 The upholstered panel is made with a medium gray velvet texture fabric and accented with large square button tufts. Perfectly proportioned cases are set on contemporary styled plinth bases. The clean lined appeal of the cases is set with picture framed mouldings capturing drawers accented with large rectangular bails that are finished in a bright nickel color. 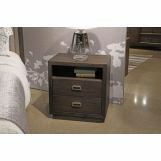 Night stand features an A/C power supply with two USB charging ports.